The Clan Thompson Pipe Band , representing Eastern Nova Scotia. In the early spring of 1984, Antigonish piper Scott Williams was invited to organize a 100-member massed pipe band to perform during the visit of His Holiness, Pope John Paul II to Halifax on September 13th and 14th. The event was an unfortunate washout, in the literal sense of the word, with torrential rains and very cold temperatures. While most people watched on television from the comfort of their own living rooms as the historic event unfolded, many thousands more braved the elements and gathered in the Halifax Commons. The Papal Visit Pipe Band performed, and the day was a tremendously moving experience for all who took part. As the pipers and drummers were packing away their soggy, wet uniforms for the trip home, Pipe Major Janette Gillis and some of the members of the Ceòl an Eilean Pipe Band from Pictou County and Cape Breton, approached Scott and asked if he would teach an adult class that members from both sides of the Canso Strait could attend. He agreed, but made it absolutely clear that he was not interested in getting involved with their pipe band. When the classes began the next week, only those pipers from Pictou County turned up. 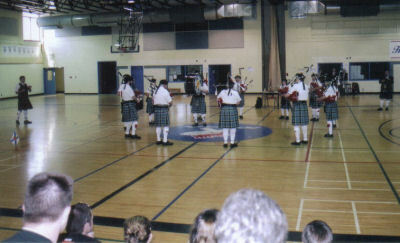 Within a few weeks, more pipers joined them and a few drummers started coming along as well, under the direction of Sue Ellen Cummings MacDonald. Despite everyone’s stated intentions, the Clan Thompson Pipe Band was born. bingos and selling programs at Pictou County High School Hockey games. The band entered competition for the first time in 1985, playing in the Grade 3 events, and placing second overall in the Champions Supreme standings at the end of that very first season. For the next five years, the band grew in size and went from strength to strength, placing first or second in every Grade 3 competition in the Atlantic Provinces, and taking a whole string of minor prizes at Maxville and Montreal. In 1987, for example, it finished in second place in the standings for the Grade 3 Champions Supreme. In 1988, the 28-member band was completely outfitted in a new uniform consisting of Dress Blue Thompson tartan kilts, legion blue jackets, balmorals and black sporrans, cream-coloured hose, and black brogues. Though several of the members purchased their own uniforms, the remainder were paid for in large part by a very successful “Great Duckie Race” on the East River, in New Glasgow that drew crowds estimated at more than three thousand and coverage on the ATV television network. This fund-raiser was so successful that it was repeated annually for several years, insuring the band a regular source of income to help purchase additional uniforms and equipment and to travel to competitions. Among the early members of the band were Pipe Major Scott Williams, Pipe Sergeant Madelyn Evans, pipers Bev Sample Ollerton, Peggy Morrell, Janette MacLeod, Monique Henderson, Hayley Clarke, Theresa MacDonald, Scott Long, and Anne MacMillan, Leading Drummer Sue Ellen Cummings MacDonald, bass drummer Karen Holly, snare drummers Lee Bezanson and Pam MacGillivray, and tenor drummers Lee Cleveland and Keah Evans. Others joined in the following years, including pipers Barbara Stewart, Sandi Roberts, Patricia Vickers, Bill Haslam, Sheila Cameron, Valerie Cooke, Marilyn O’Brien, Sheila Redden, Sandra MacIsaac, Edward Langille, Doug Stewart, Dane Grant, Frances Doudelet, and Katerin Basque, as well as drummers Lianne Bradshaw, Arron Bradshaw, Nancy Sinclair, Donald Margeson, Kelly Arsenault, and Natalie Alfe. 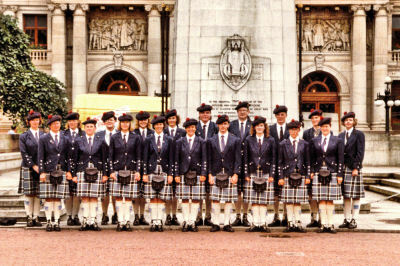 Despite the apparent good health of the band,in 1988 Pipe Major Scott Williams and Pipe Sergeant Madelyn Evans saw that it was becoming increasingly difficult to attract experienced musicians who had a high level of skill and playing ability, and who would be dedicated to achieving success in competition at the national and international level. The band had already attracted all the pipers and drummers from Antigonish and Pictou Counties and Cape Breton who could play at the necessary level, but the recent competitive successes of bands in Metro Halifax had all but dried up that area as a potential source for additional recruits for Clan Thompson. Madelyn and Scott decided that, if their band was going to survive, they must begin to train young pipers locally. Madelyn started classes in Stellarton and Scott started classes in Antigonish that gradually produced a number of excellent young pipers, but not in time to save the Clan Thompson Pipe Band as they had hoped. Though its highest accolades were still a year away, the band had already begun to slide down that long, slippery slope. 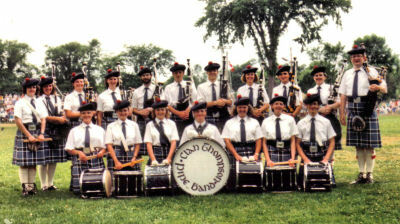 The Clan Thompson Pipe Band reached its competitive peak in 1989 when it finally won the Grade III North American Pipe Band Championship in Maxville, Ontario and the next day placed second at the Montreal Highland Games. These successes were made possible in large part by the excellent drum corps then under the direction of Lianne Bradshaw, of Antigonish, who led her drummers to first place finishes at both events, acquiring the title of Grade 3 North American Championship Drum Corps at Maxville. With these successes behind them, the band travelled on to Scotland with high hopes for continued victories there. Sadly, the band finished a disappointing fourteenth in the World Championships in Glasgow. This was due in large part to an error in time of play printed in the souvenir program that sent the judges off to lunch in the city, arriving back more than an hour after the Grade 3 band event was actually scheduled to start. The Clan Thompson Pipe Band had spent the morning sheltered from the rain in their bus in a remote part of the field separated from the other band buses, and the stewards were unable to find them to advise them of the change in starting time. When the band reached the peak of its performance preparation and marched in the rain across the field to the Grade 3 competition circle, instead of cheering crowds and a panel of judges, they were met by a solitary steward huddled under an umbrella who told them of the delay, which would see them have to wait more than an hour and a half before they eventually played. Despite every effort to keep as dry as possible, the band and their fragile reeds got wetter and wetter. When the sun eventually came out in mid afternoon, it was enough to send the pitch of their chanters over the top and they began what proved to be a futile effort to bring them down again. As they marched up to the line, every piper in the band knew that, no matter how well they played, the sound of their pipes would not be good enough to win them the coveted prize. At the competitions at Perth the next day, the band had recovered a little bit, and had dried out somewhat, but spirits were still low, and they placed ninth. After another five days of drying out or replacing reeds re-established their confidence, however, and the band placed second at Rothesay, on the Isle of Bute, and finished off their competitive efforts in Scotland with a fourth place finish in Dunfirmline. The pipe major of one of their rivals, the Cooper and District Pipe Band, commented that if the band had sounded as well at the Worlds, they would have definitely finished “in the money”! That, at least was some consolation. During their nineteen-day stay in Scotland, the band made a brief tour of the Highlands, visiting the Glenfinnan Monument, Eilean Donan Castle, the Piping Museum at Borreraig, on the Isle of Skye, and the historic old town of Inverness. They attended the 78th Fraser Highlanders Pipe Band concert in Edinburgh, and also visited Edinburgh Castle and Holyrood Palace. In Glasgow, the band performed on George Square, and was presented with the Coat of Arms of the City of Glasgow at a reception hosted by the Lord Provost in the City Chambers. Now ready to advance to the Grade 2 level, the band suffered a tremendous loss when several pipers and drummers left the area to pursue educational and employment opportunities elsewhere. Among them was leading drummer Lianne Bradshaw and her brother Arron, leaving the band’s new lead drummer, Pam MacGillivray, with a fairly novice snare section. The pipe section remained strong, and they continued to compete successfully at the Grade 3 level for the next three years, but they were unable to advance to the Grade 2 level as they had planned. In 1990, the band returned to play in Maxville, placing fifth, and in Montreal, placing second. In 1991, the band was awarded the Grade 3 Champions Supreme award by the NSPPBA, and in 1992, with reduced numbers, they placed second overall in the Champions Supreme standings. The membership list submitted to the NSPPBA for that season included: Pipe Major Scott Williams, piper Sergeant Madelyn Evans, pipers Bev Sample, Valerie Cooke, Edward Langille, Dane Grant, Janette MacLeod, and Frances Doudelet, bass drummer Karen Holley, Tenor drummer Nancy Sample, and snare drummers Pam MacGillivray (lead), Lee Bezanson, Donald Margeson, Kelly Arsenault and Natalie Alfe. The band had lost momentum, and the members decided to take a year off from competition in 1993 in an attempt to give everyone a break from the hectic schedule of competitions that saw them on the field an average of nine weekends every summer since 1984. Pipe Major Scott Williams spent the year in Scotland as an exchange teacher, and when he returned in the summer of 1994, only eight former members showed up at a meeting called to reassemble the band. The band finally and officially broke up in the spring of 1995. During its time, however, the Clan Thompson Pipe Band provided many pipers and drummers with the opportunity to play at a higher standard than had been possible in the region since the 1970s. It also spawned classes which led to the rise of two very strong junior bands, the Balmoral Pipe Band of Stellarton and the Antigonish Highland Society Pipe Band. Some of its members went on to play with Grade 1 pipe bands in Nova Scotia and Ontario, and two of them - Scott Long and Dane Grant - went on to record and tour with internationally renowned Celtic musicians such as Ashley MacIsaac and MacKeel. 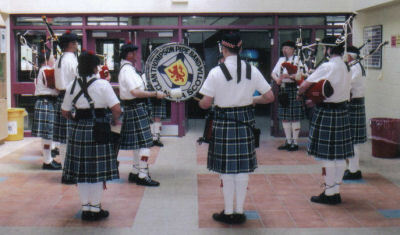 In February of 2006, after a lapse of about eleven years, some of the band’s original members met to discuss the possibility of reviving the Clan Thompson Pipe Band. It only took a phone call to persuade Pipe Major Williams to join them and rehearsals began shortly thereafter. A fairly strong pipe section grew quickly, but it took over a year to put a drum section together with Owen Muir as lead drummer. The band appeared in competition for the first time at the Antigonish Indoor Meet in May 2007, placing 3rd overall in the Grade 4 band event. The band began accepting engagements, playing parades in Port Hawkesbury, Westville, Liverpool and Antigonish, a series of five summer evening concerts at the DeCoste Centre in Pictou, the Antigonish Highland Games Tattoo, the Festival of the Tartans in New Glasgow, and a private birthday party in South Side Harbour. Revenue from these engagements enabled the band to purchase additional drumming equipment and augment its uniforms. In August, the drum corps began receiving instruction from Father Neil R. McKenna, formerly the lead drummer of the internationally acclaimed Antigonish Legion Pipe Band. It is hoped that the band will be able to make the jump back up to Grade 3 for the 2008 competition season.